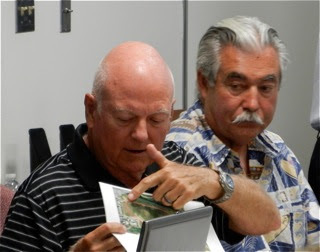 Wednesday evening the Costa Mesa Fairview Park Citizens Advisory Committee met in their second formal meeting - they had a walkabout in the park a couple weeks ago - and presented each individual's ideas for things they'd like to see in the park in the future. You can read Bradley Zint's coverage of the meeting in the Daily Pilot HERE. The meeting, conducted by Chairman Dr. Richard Mehren, started a little late due to a previous meeting in the venue and ran even later because of the spirited discussion on certain parts of the agenda. City Clerk Brenda Green provided an overview of the procedures to be followed and The Brown Act. For example, eleven people stepped to the microphone during Public Comments and expressed THEIR views about the park, what they hoped to see and why. 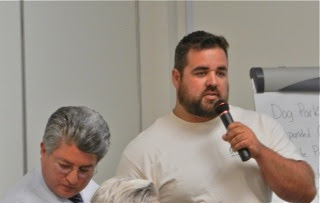 Comments ranged from Gordon Bowley of Costa Mesa United requesting his group be given the opportunity to present its views to the committee to a mother explaining the value of the model trains to her Autistic son. 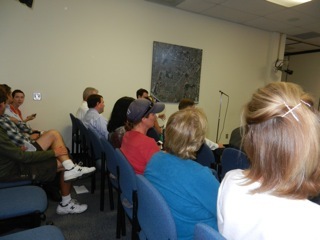 By far, most speakers requested the committee to keep Fairview Park as-is - a natural resource and a "jewel of the city". Parks Project Manager Bart Mejia guided the group through the Work Plan, HERE, a document intended to provide structure and a rough timeline for the committees task. Mehren conducted a poll of the committee members, who had been requested to bring five (5) things they would like to see in Fairview Park, through the process of chronicling those items. They went around the table several times as each member had a chance to list a preference. I began to get dizzy(er) as they went round and round. This exercise gave observers a pretty clear idea of how the discussions may go in the future. Ron Amburgey said he wanted to see football and soccer fields, baseball and softball facilities, basketball and handball courts, a roller hockey surface, bocci ball venue, Dog Park and a Skate Park. Terry Cummings, a model train advocate, said he would like to see a coastal redwood forest in part of the park. He also wanted to see a cultural center, including a native American village. He also wanted to see the model trains routed over the steel bridge over Placentia Avenue and a couple of track loops on the westside of the park. 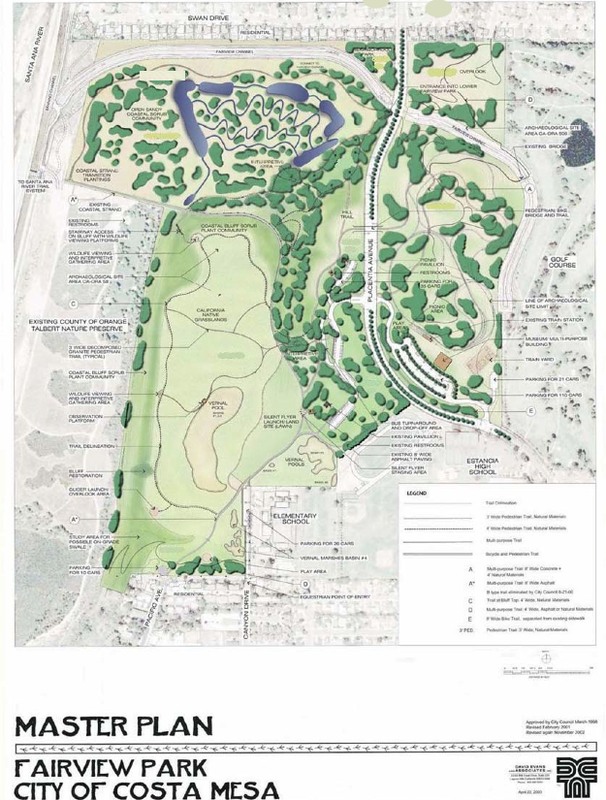 Lee Ramos wanted an Interpretive Center with an outdoor theater, relocating the railroad tracks to the perimeter of the Eastside of the park to facilitate placing other venues within that loop. He also wanted to see more informational kiosks and an area for senior Lawn Bowling. Brett Eckles wanted to see multi-use athletic fields, expanded train routes, marked running courses, improved bike paths and a nature center with bird-watching venue. Richard Mehren wanted additional picnic structures, repair of the sprinkler systems and replacement of some dead grass areas, a safety barrier surrounding the parking area on the Eastside of Placentia Avenue to protect folks from wandering into traffic from the parking lot. Mehren and Anna Vrska wanted the eroding bluffs repaired and barriers established to keep errant folks from eroded area. 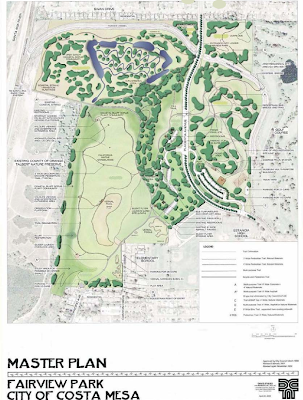 Vrska wanted to stay with the existing Master Plan, improve information kiosks throughout the park and plant native plants in those grassy area mentioned above. Dennis Popp wanted a wildlife viewing area in the Northeast and Southeast quadrants. He also wanted to use part of the Northwest quadrant for a community garden and have exercise stations - ladders, etc., - located along the paths. Steve Smith and David Stiller wanted better handicapped access to the park. 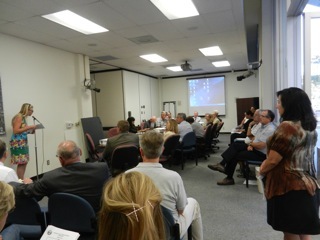 Biologist Barry Nerhus, Jr. provided an overview of the habitat for the committee members. The next meeting will be August 21st. I am very glad thatfor the most part it seems the committee realizes what a jewel this place is, and want to repair it and keep it for the entire city to enjoy. Only a couple want it for their special interests. But in the end, I suspect it won't matter much anyway, unless we can get rid of Mensinger and Righeimer. It's not what it seems... Ron Amburgey took all the heat for the development suggestions while the other members played it quiet. This committee was hand picket by Righeimer and Mensinger. They only picked people that are for what they want which is development. When the time comes it appears that this stacked committee will vote for whatever Righeimer and Mensinger want. Most people are calling it a dog and pony show.